Between my product junky-ness and love of watching TV shopping channels, a couple months ago I watched a presentation on HSN (Home Shopping Network) on a new hair care line called Tweak-d presented by a man who looked extremely familiar. If you are a long time QVC watcher you may remember Denis Simioni who used to present Ojon Hair products. Well, he is now on HSN presenting something new and because of how awesome Ojon used to be when he presented it, I had to stop and listen. He is nicknamed "The Indiana Jones of Hair Care" as he always finds new and innovative ingredients to help bring us our best locks. Tweak-d is full of lots (around 70 in each formula) of different beneficial ingredients from all around the globe!! The Ultra Nourishing Treatment, a universal formula for all hair types, especially for normal to thick, unruly, coarse hair. I have had success with both formulas, I apply them as directed on dry hair prior to the shower and usually wait around 10 minutes to get wet. The restore treatment says you only need it on for 3 minutes. Both treatments work successfully at cleansing and conditioning my hair on their own with nothing else needed. But being the product mixologist I am, I also have had great success using them and then following with other cleansers and deep treatments sometimes. 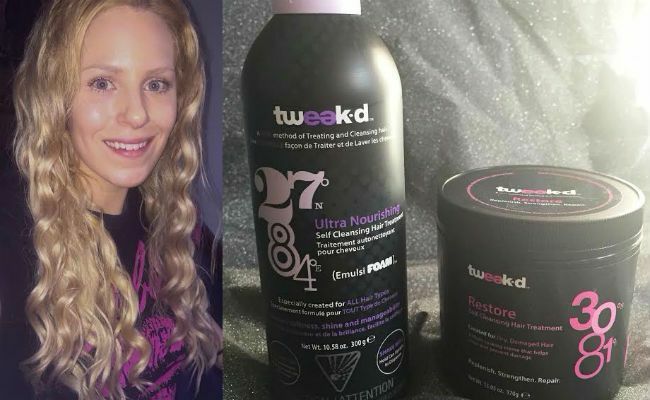 Tweak-d Hair Cleansing Treatments are all formulated without Harsh Chemicals, Sulfates, Parabens, Synthetic Dyes, Petrochemicals, Phthalates, Mineral Oil, PABA, GMOs, DEA, Triclosan, and Animal Ingredients. Created Especially for Dry, Damaged, Frizzy, Weakened Hair. A 7 in 1 Multi-tasking treatment that helps to undo and prevent damage. Formulated with Dhatelo Oil from the Himalayas. Especially created to replenish and strengthen dry, weakened, damaged, frizzy hair. What is it? RESTORE Self Cleansing Hair Treatment was developed to offer consumers the opportunity to use it as an intensive hair treatment, shampoo, conditioner, deep conditioner, detangler, leave-in conditioner and shine enhancer all in one easy-to-use product. It's a multi-tasking, no fuss system that saves time, effort and money. Featuring and formulated with DHATELO Oil from the Himalayas. What will it do? Our RESTORE Self Cleansing Hair Treatment is a super-hydrating recovery treatment that instantly restores strength, shine and bounce to dry, damaged, weakened hair. This seven-in-one multitasking formula provides maximum anti-breakage protection against chemical treatments and tools so that hair is not only repaired and replenished, but also thoroughly protected inside and out. The treatment is full of botanical extracts, blend of essential fatty acids, amino acids, antioxidants, lipids and naturally sourced cleanser. It it formulated with no sulfates, chemicals, parabens, synthetic dyes, petrochemicals, phthalates, mineral oil, PABA, BEA and Animal Ingredients. RESTORE SELF CLEANSING HAIR TREATMENT IS CLINICALLY PROVEN TO REDUCE HAIR BREAKAGE BY 94% IN JUST 1 USE! I have been suffering from some terrible breakage, dryness, frizz and unmanageability so I am always super excited to try anything that will help it. The smell of this stuff is pure heaven. It has a warm, vanilla musky scent very similar to some Ojon products I used to use. This was the first Tweak-d product I tried and I used it on its own quite a bit before trying the Ultra Nourishing. I was using it every wash, 2x a week and now I generally am using it 1x a week and the Ultra Nourishing cleanser the other. The product feels like a nice, thick cream. It does not lather in your hair, which personally I am fine with. It is SUPER concentrated and a little goes a long way. I like that this is in a tub, it makes it easy to scoop out and use without having to fight with a bottle spout or pump, especially because of the thickness. I apply it on my dry hair before going into the shower. It says on the label to not leave this product in for more than 3 minutes but sometimes I do wind up leaving it longer. It is nice to know though I can get all the benefits rather quickly- time saving for sure. From my very first use, once I get in the shower I rinse the treatment out, my hair already my hair feels better. My hands glide through my wet hair with ease- much more than I am used to! The directions state once you rinse it out to reapply it on soaking wet hair and the scalp, adding a splash of water to help emulsify. Sometimes I do this now, and sometimes I wet and emulsify the product when it was already on my hair first use and follow up with other stuff to mix. I massage my scalp and spent time massaging the product through the lengths of my hair. Then I do my other shower stuff (cleanse body, brush teeth, etc) and rinse it out. Detangling was effortless and I just could not believe how smooth my hair felt. Whenever I use the Restore treatment, my hair feels like silk instead of hay. Whenever I use the Restore treatment, my hair feels like silk instead of hay. It has helped all of my hair, but especially the newer last 6/7 months grow that don't have underlying bleach on it. It looks shiny, feels smooth and so soft. I think using this regularly has really stopped with breakage and excess shedding which is AMAZING for me. This is now Holy Grail status and if I had to only pick onetweak-d formula to use, this would be it! This cleansing formula is designed to be Universal. Perfect for all hair types and textures, especially for people with normal, thick, coarse and unruly hair. Renews softness, shine and manageability. Formulated with CHUIRI Butter from Nepal. (1 of 79 Ingredients tweak-d to perfection) FeaturesProprietary EmulsiFOAM technology that ensures the proper distribution of thr ingredients, while cushioning and maintaining a moist environment allowing for greater penetration of our active ingredients into the hair fibers. What will it do? This Intensely nourishing Self Cleansing Hair Treatment has a rich consistency that sensuously disciplines the hair fiber with a smooth fluid touch from roots to ends, delivering frizz control while imparting an incredible shine. Enriched with humectants, hydrating butters, oils, extracts and a hydrolyzed protein, our ultra-nourishing formula provides overriding moisture retaining properties, fuel for appropriate nutrition, strength, structure, conditioning, and aids in the restoration of potential surface damage done to the hair during every day processing. No matter what kind of hair you have it will instantly and easily detangle to avoid damage from excessive combing. Thick, curly and unruly hair may splurge daily; others will love as a weekly soak. This cleanser smells yummy as well. It is not quite as musky as warm as the Restore, it is more of a sweet gourmands meets a light floral. Regardless I really like it. The product dispenses out of the container like a foam mousse or shaving cream. I rub it between my hands and distribute evenly on my dry hair section by section. I apply it and do the same things as I do with the restore treatment. Like the Restore treatment, this also leaves my hair feels very soft and silky. I also feel that this really moisturizes my hair extremely well. The one drawback to this product is that it's hard to tell how much is left in the can so I will always need a backup on hand in fear of running out. I have no complaints and love the addition of the Ultra Nourishing to my hair care routine as well. Since regularly using these two tweak-d formulas as part of my wash day routines, I have noticed less breakage, more softness, and shine, better manageability and less frizz. Sometimes I will also add a little or either/or back in as a leave in conditioner. I really like that each formula has a lot of different beneficial ingredients to get my hair healthy again and also keep my scalp healthy and clean as well. I already repurchased both. In USA, they are only available on the HSN website and do tend to sell out so I may or may not already have 3 backup jars of the Restore.